Bcl-2 is a family of evolutionarily related proteins. These proteins govern mitochondrial outer membrane permeabilization (MOMP) and can be either pro-apoptotic (Bax, Bad, Bak and Bok among others) or anti-apoptotic (including Bcl-2 proper, Bcl-xL, and Bcl-w, among an assortment of others). There are a total of 25 genes in the Bcl-2 family known to date. Human genes encoding proteins that belong to this family include: Bak1, Bax, Bal-2, Bok, Mcl-1. Bcl-2 family members have been grouped into three classes. The anti-apoptotic subfamily contains the Bcl-2, Bcl-XL, Bcl-w, Mcl-1, Bfl1/A-1, and Bcl-B proteins, which suppress apoptosis and contain all four Bcl-2 homology domains, designated BH1-4. The pro-apoptotic subfamily contain BH1-3 domains, such as Bax, Bak, and Bok. A third class of BH3 only proteins Bad, Bid, Bim, Noxa and Puma have a conserved BH3 domain that can bind and regulate the anti-apoptotic BCL-2 proteins to promote apoptosis . The intrinsic pathway is initiated by various signals, principally extracellular stimuli. BH3-only proteins (Bim, Bid, Bad, Noxa, Puma) engage with anti-apoptotic Bcl-2 family proteins to relieve their inhibition of Bax and Bak to activate them. Next, Bax and Bak are oligomerized and activated, leading to mitochondrial outer membrane permeabilization. Once mitochondrial membranes are permeabilized, cytochrome c and/or Smac/DIABLO is released into the cytoplasm, wherein they combine with an adaptor molecule, Apaf-1, and an inactive initiator Caspase, Pro-caspase 9, within a multiprotein complex called the apoptosome. Smac/DIABLO inhibits IAPs to activate Caspase 9. Caspase 9 activates Caspase 3, which is the initiation step for the cascade of Caspase activation. The extrinsic pathway can be activated by cell surface receptors, such as Fas and TNF Receptor, subsequently activating Caspase 8, and leads to Caspase 3 activation and cell demolition. Caspases in turn cleave a series of substrates, activate DNases and orchestrate the demolition of the cell. Bcl-2 family proteins are also found on the endoplasmic reticulum and the perinuclear membrane in hematopoietic cells, but they are predominantly localized to mitochondria .
. Cotter TG, et al. Apoptosis and cancer: the genesis of a research field. Nat Rev Cancer. 2009 Jul;9(7):501-7.
. Kang MH, et al. 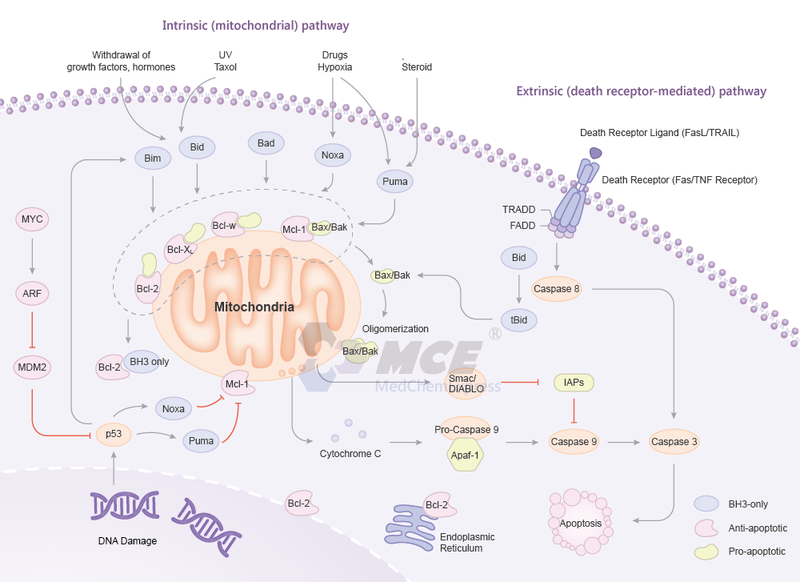 Bcl-2 inhibitors: targeting mitochondrial apoptotic pathways in cancer therapy. Clin Cancer Res. 2009 Feb 15;15(4):1126-32.